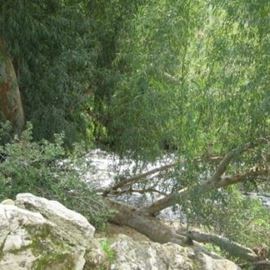 The Tzora Forest was planted by KKL-JNF in 1993, new immigrants were employed to do the forest work, parking lots, and new walking paths. 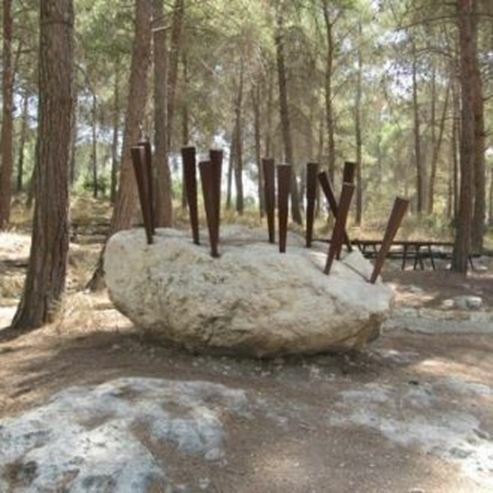 The route passes through the sculptures, with the statue of the "Forest Guard" standing at the entrance, and it is dedicated to preserving the forests in Israel. Later, 37 sculptures are erected, which together constitute a collection of environmental sculptures, some of which emphasize their integration into the landscape and some of the region's past. The idea of art in nature was initiated by KKL-JNF. It provided stone blocks to artists who were invited to sculpt their works. Stone and ironworks reflect major events in the lives of our biblical ancestors. One statue depicts the heroism of Samson and another sculptor the "Comb" in which Delilah combed Samson for the last time in his life, and more. In the course of the war, the building served as the headquarters of the Harel-Palmach Brigade, and later as a temporary residence for the first settlers of Kibbutz Tzora, until it was relocated to its current location. 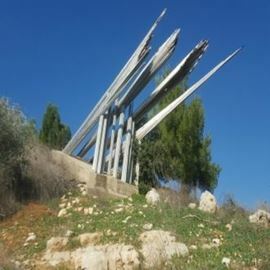 The biblical Tzora, located on Tel Tzora is the next site down the road. The inhabitants of Tzora worked in agriculture and grew mainly vineyards. Ancient winepresses and remains of interesting ancient agricultural activity were discovered here. Descending the Tel, continue and turn right to the green marked path and right again until the intersection with a sculpture of the "Blue Eye". Continue to the intersection where the sculpture "Window to Nature" is located, turn left and arrive at the parking lot with two observation points, the lower one is suitable for people with limited mobility. On the top one, there is a voice system where visitors can listen to the story of Samson and Delilah. Another observation point accessible from the parking lot to the observation point is located later on through the sculptures, the road is marked. The trip back down the paved path leads to Kibbutz Tzora and to road 38. In the forest, picnic areas were installed in which water taps, garbage cans, barrels for collecting coals, playgrounds for toddlers, and biological services were installed. Along the route, there are signs and directions.